Europe is in refugee crisis and hate on new comers is increasingly raising radical populist movement. Some countries like UK have voted to leave EU simply because they wanted to stay away from immigrants. Hungary conducted a quota referedum that rejects EU’s plan to relocate refugees from most vulnerable countries. Germans are constantly pressuring the ruling party to change its stand on refugees. France had a populist political party that campained during the 2017 Presidential election under the motto of “French Freedom” putting its objective clear for anti-migration that could have put refugees and asylum seekers life in danger. Italy is an exception. Italian society had a history of deeply rooted racism. In 1937, it had passed a racial law, almost like apartheid, that was implemented in its former colonies like Somalia and Eritrea. This fascist law is part and parcel of Italian life making immigrants as most hated groups. According to Statistica, about 52% of Italians feel no longer at home because of Immigration. Being the main entrance gate for immigrants, Italy has been affected by migration influx with nationals who come from almost all over the world. Italy’s weak economic status and high unemployment rate is not enabling refugees integration easy. Instead, immigrants are constantly facing hate by those anti-immigrant movements. Though the government has no special legal restriction on migration, it is hard to say that there exists basic humanitarian assistants that hosts immigrants and provide them shelter and food services. Instead, NGOs are highly involved in providing food and clothing. What these immigrants face the most challenging is shelter. There is ‘NO’ housing services provided for these new comers. Each immigrant has to find his/her own means to stay some where. As a result, thousands are forced to start their life in streets a psychological shock worse than what they had gone through in their way to Europe. Very few manage to occupy empty houses. For example, there are thousands of Eritreans who are living in old and abandoned buildings in the heart of Rome. These immigrants consider as a better alternative than being exposed to harsh winter climate and die from freezing. Being women with children most vulnerable, they are among those who are frequently to live in these dangerous buildings without having any legal permit to live. Mostly from Eritrea, about 800 refugees from Eritrea faced a police riot at 05:00 AM, by over 300 strong police force. These refugees were living in the building since 2013. Most are women and children. Though Italian authorities claim that these refugees rejected to be relocated in other housing provided by the state, the refugees continues to live until the police came in and evicted them by force. What happened during these two tragic days is shocking to human history. A clash between refugees and police broke out in the square where water canons were used to crush the protest. Women and disabled women were among those who became victims. Some people were injured during the riot. The only medical service that came to help the refugees was “Doctors with Out Borders”. It is only after these doctors came in and called for immergency help ambulances started to arrive. Italy is investing massively to stop immigrants coming into its offshores. It is cooperating with Sudanese Border Control forces to block immigrants in their departure place. And it is working with Libyan authorities to stop any boat leaving from the territory of Libya. All except the last one are extremely anti-refugee announcements. Introducing unpaid work for refugees can be a violation of basic human rights. Most migrantion has a humanitarian cause. Thinking to detain, participating them in forced labour, forced returns without having a detailed understanding of the receiving country or the danger an immigrant may face are basic entities that needs close studies. Refugees call him “The savior” and many relate him with the Biblical “Father Moses” who was called by God to save Israel from slavery and lead them out of Egypt. The tragedy of 21thC exodus has many parallels with that of Biblical Exodus. Many Africans are in almost slave like situation in their home country. They can not continue to live in miser there. Some are politically disadvantaged, and many are living in extreme poverty. To get freedom and lively free as human, these desperate Africans target a place where their dream is to live in peace and liberty. To reach this dream land, they sacrifice their life, “either reach there or die”. What they pray during this long journey is to get someone who can be on their side and lead them to the land of dream. Humanistarian Activists like Abba Mussie Zerai, are out for this imagined assistance to be available. It is this simple link that Abba Mussie Zerai is accused of as a possible agent of human trafficking. A 2015 Noble Prize Nominee, Abba Mussie Zerai is by himself a refugee living in Swithzerland giving church services to refugees from Eritrea who follow Ge’ez Rite. Beside his Church services, he is also involved in helping immigrants who cross the Mediteranean Sea once they found themselves in distress. But his noble service is not welcomed by those who hate refugees. For long time, many politicians and hate groups tried to criminalize his engagment in the humanitarian works. Italian prosecutors from Siscilia are investigating his case by accusing him as one who is working with smugglers. So far, they are unable to support their accusation. 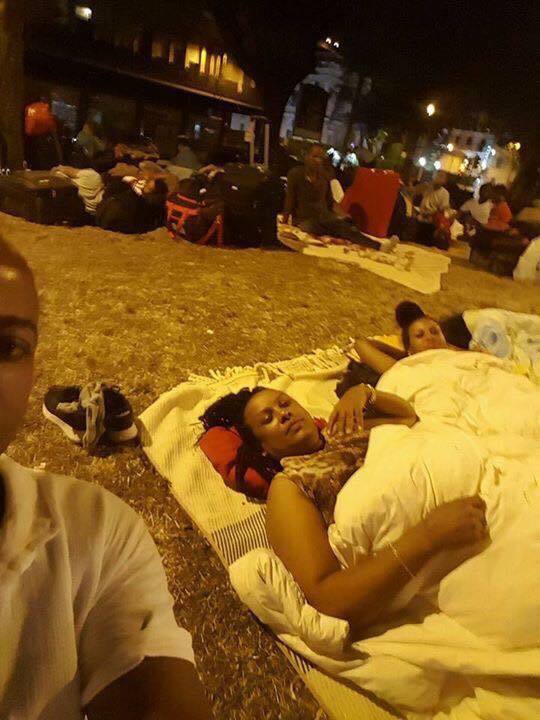 I am not naive to expect Eritrean officials to intervene in the current refugee crisis in Rome. Those who became victims of police riots are mostly from Eritrea. Under normal condition, the Embassy of Eritrea is supposed to speak out for them. Instead there is neither official statement nor any kind of material produced that raises concern of these refugees. Instead, Eritrean authorities are cooperating with Italy to put migration impossible. Abba Mussie Zerai is the main target of Eritrean officials. A pro-Eritrean government website, tesfanews.net has written more than 20 articles for the last 8 or more years to defame and blackmail him. what happened on July 05, 2017 to Eritrean government officials in Rome could have some implications in the current tragedy of Eritrean refugees in Rome. It is not a secret that PFDJ is a Mafia group. It can cooperate with any group that is willing to take revenges. And these Anti-Immigration groups are more than happy to get a green light from the same mafia group that runs a whole country. The world is witnessing what is happening in Italy. Refugees are not getting any assistance though they were supposed to be protected under the 1951 Refugee Convention. Those who get refugee status are finding themselves in difficult situation. Those who managed to find temporary shelter are now becoming victims of ANti-Refugees riots. Humanitarian agencies who are fighting for the rights of refugees are reaching to a stage which makes their work as a crime. And iindividuals like Abba Mussie Zerai are now under investigation by prosecutors. All these moves are not sane. There is a clear pattern of anti-refugee movement going on at a state level. And it is a violation of the 1951 Refugee Convention. Unless responsible boby intervenes and discuss with Italian authorities to take its responsibility of protecting refugees, life will not be easy. And this unstable life of refugees can bring unprecedented negative consequence. It is simply naive to expect Eritrean authorities to come and defend for the rights of citizens. In the first, they were victims and now they care less if these same victims are trapped into another tragedy.